"There's more to discovering a destination than following a map!" CRUISE SHIP VISITORS WELCOME! Looking for an English-speaking SAIPAN guide? | Ground Business Services? | a Film Location Manager? "I was all over the internet looking for a guide. I think I saw one guy on a private tour site. But there was nothing else on that site to tell me his background or reviews or anything. I thought there has to be more to Guam then a lookout point! You are the closest person to Guam I know so I thought why not ask!" Thanks Walt. Yes, Susan is correct! There is more to Guam than a lookout point! So, I referred her to a certified Guam guide to give her a great experience! Founder's blog. Guamdate: Feb 2014. You could not have imagined, wished for, nor created a more perfect day for a returning war hero! I flew from Saipan to Guam on the 4:15am flight (which I almost missed, but that's another story for another day!) to meet Lloyd's cruise ship, the Crystal Serenity arrive on Guam. By about 7:30am on Guam, after a typical, tropical "morning blessing" sun shower, the sky opened up and revealed a crisp blue sky and dry weather for the ship's arrival! Rainy morning on Guam; not to worry, the forecast predicted great weather! Judy and Lloyd at the War in the Pacific National Historic Park Asan Beach park "unit"
Once we get to the Visitors Center, after a few introductions and a bit of milling about, we start a mini presentation for the visitors in attendance. Park Ranger Ben Hayes welcomes Lloyd to the center and bestows a medallion. I then shared the story of how Lloyd and I met online, and how we cultivated a unique relationship for two months while he was still in California, and I on Saipan! Afterwards, I shared the surprise I've been anxious to reveal for quite a while. Lloyd had only a faint idea that something was brewing behind all the detailed questions I'd been asking him during our email conversations. 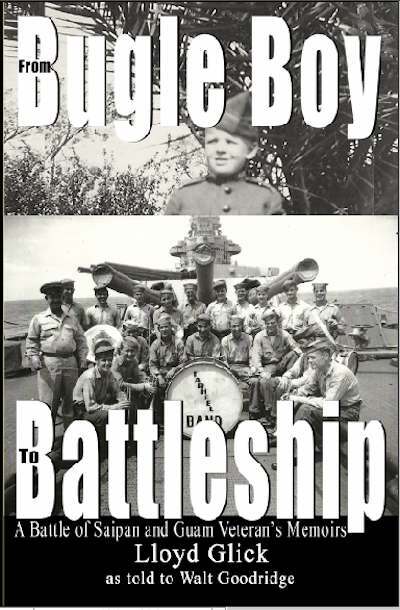 I revealed, finally today, the reason for it all: I'd secretly compiled, prepared and created an "as told to" autobiography of Lloyd Glick the bugle boy scout, the enlistee, the Musician Second Class, the battleship sailor and now returning war vet, entitled Bugle Boy to Battleship: A Battle of Saipan Veteran's Memoirs...as told to Walt Goodridge! Lloyd and his autobiography..hope he likes it! Next, we head out onto the island with Ranger Ben Hayes, who gives a spectacular, detailed, and at times quite moving tour of sites at several of the National Park's "units." Joining us for the day was also Cameron Miculka, whose father was the first ranger on Guam, and who got an exclusive all-day interview with Lloyd! Since Ben has the keys to it, we got a rare, exclusive treat and got to visit inside the communications bunker at Fonte Plateau. Very few folks get to go inside! Next, we stopped at Simply Food (my favorite health food store and restaurant on Guam, operated by the Seventh Day Adventist Church) to grab something to eat, and were treated to lunch on the house by the director and manager of the restaurant. While at the Visitor Center, local author, great spirit, and marketing maven, Dianne Strong (author of Witness to War), who had been there promoting her book, made a quick call to local (Pacific News Center) television station anchor, Kevin Kerrigan, who then contacted me to arrange a special interview with Lloyd. The gracious wife, the Jamaican, and the star of the show! Felix Reyes, me, Frances, Lloyd and Judy...almost final farewell! and return to Saipan on the 8:30pm flight to await Lloyd's arrival on Saipan....so we can do it all over again! See you on Saipan! | What happened on Saipan??? p.s. Thanks to all who made the day an unforgettable experience. Lloyd shared with me that the respect, recognition and warm reception he received on the island of Guam was totally unexpected, and overwhelming--in a quite moving way! Time for YOUR tour of Guam! Now, I can't promise you you'll get the royal treatment that returning veteran, Lloyd Glick, did, but sign up for my "Guam Day Tour" (see form) and discover Guam in a way unlike any other! Guides are all certified and Guam-based. NOTE: While I build up a slew of happy "I want to see Guam" customers for this site, check out these reviews from my Saipan clients and rest assured that I look for the same level of care, professionalism, attention to detail, fun and adventure from the guides you'll have for your Guam experience! See Guam at your own pace, far away from the big tour buses and large groups! Read what USA Today said about my tours! Every customer is unique. Some have unusual requests for their visits to Saipan, Tinian, Pagan and Guam--everything from simply fiding unique accommodations and transportation to locating specific individuals for genealogical research, or historical/cultural artifacts for study, to visiting "off limits" areas, and doing unique activities! That's my DiscoverGuam advantage, and that's what you pay for!